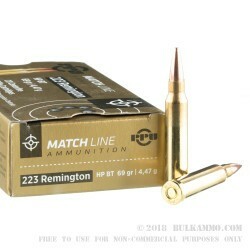 Adding additional accuracy and a larger projectile weight to an already very good .223 product from Prvi Partizan, means you can realistically expect better performance at the range or in the field against suitable game by simply making a small change in your ammo purchasing patterns. On top of that, the price increase over lighter loads is essentially negligible. 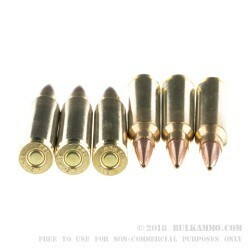 So, to grab even better performance from a bargain round by switching to this 69 grain bullet, while still keeping your price point firmly in the bargain category, it becomes very easy to rationalize picking up a box or two of this Priv Partizan .223 Remington ammo and giving it a shot. High quality projectile in 69 grain weight with a hollow point combined with excellent powders offer very strict velocity deviations keeping the accuracy high and your gun cleaner. A 69 grain projectile finds the sweet spot in the shorter twist rates of the AR platform and other rifles but itself it also quite versatile, especially among the twists found in newer bolt action offerings. Brass casing, boxer primed, reloadable cartridges, clean powder and incredible accuracy at the price point that most import bargain rounds are priced at. 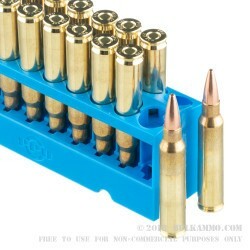 A legitimate stopper for game and for human threats in the 69 grain projectile, this is an exceptionally versatile round with improved accuracy at a very reasonable price point.